Less washing and less work involved. The texture actually is much better than the steaming version as it is easier to control the texture you want. 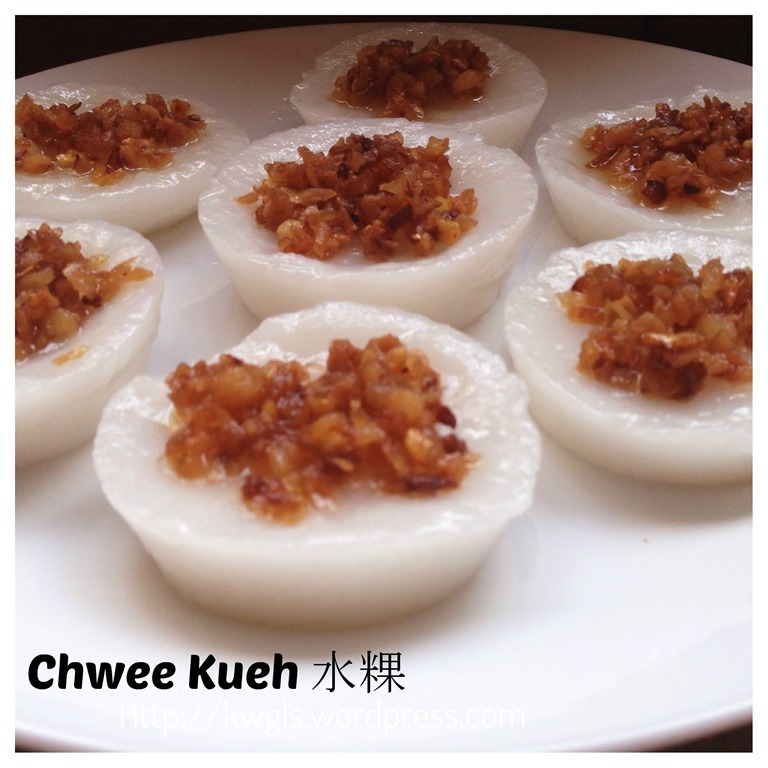 If you want a firmer and more QQ chwee kuih, you can extend the timing by 10-20 seconds.. 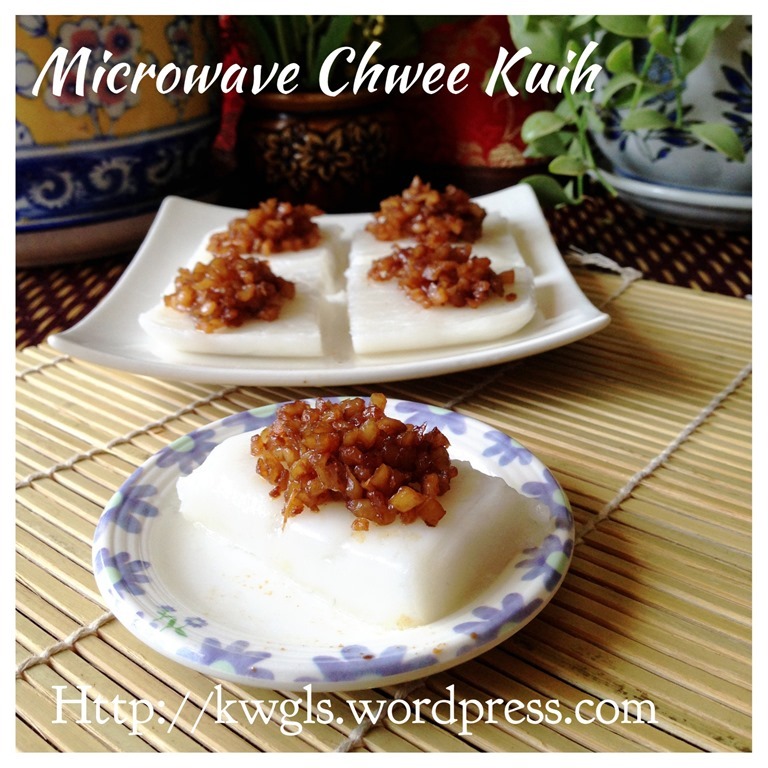 Please scroll down towards the end for an updated procedures on using microwave. 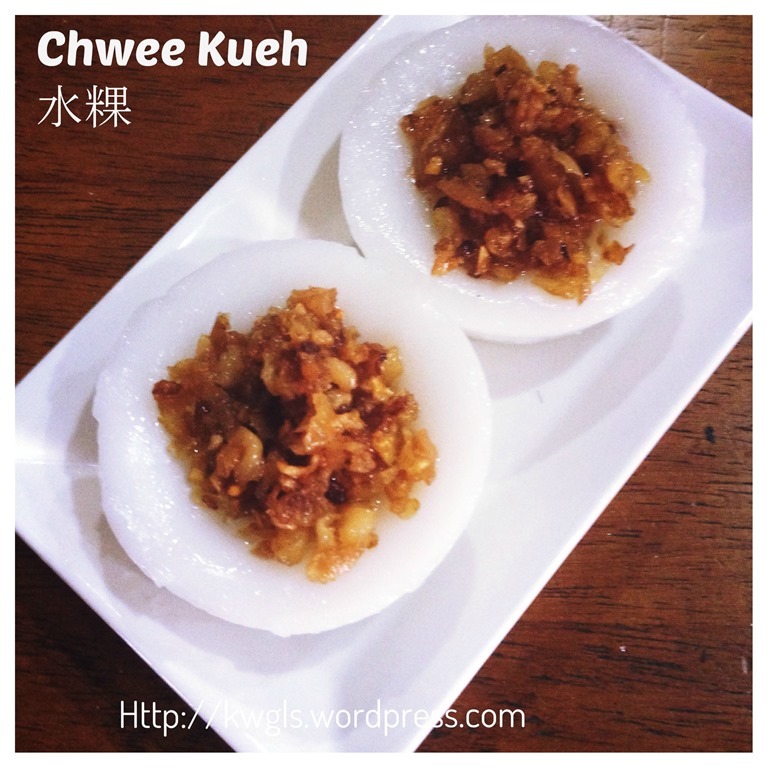 Singapore have a very famous chwee kueh store in Tiong Bahru. 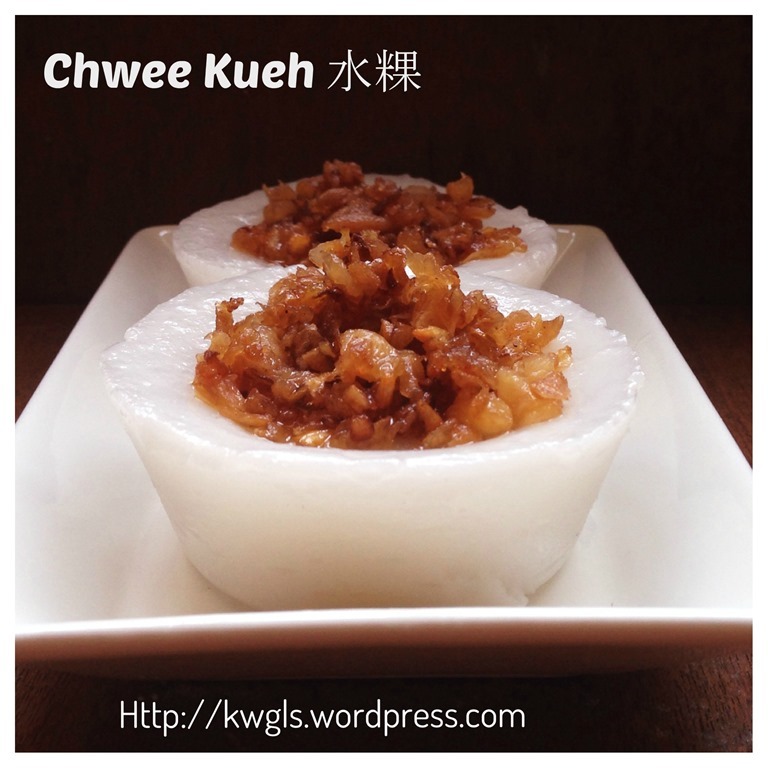 My wife likes the chwee kueh there. 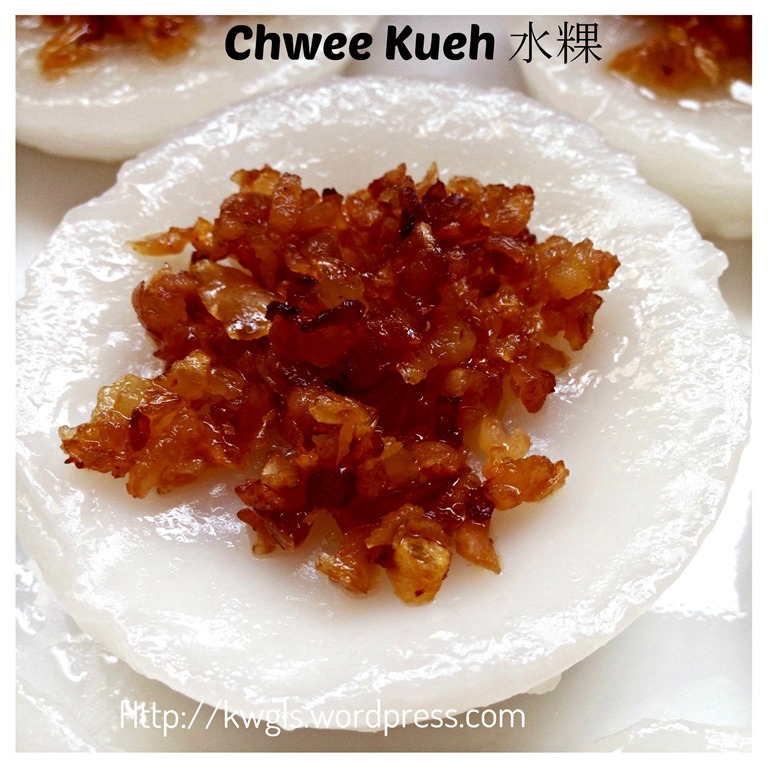 However, if you asked me if I liked chwee kueh in general, I would say, not really because it is rather oily and plain..Plain in the sense that without the cai poh or preserved radish, the rice cake can be rather tasteless and it usually comes with very little quantity of preserved radish. 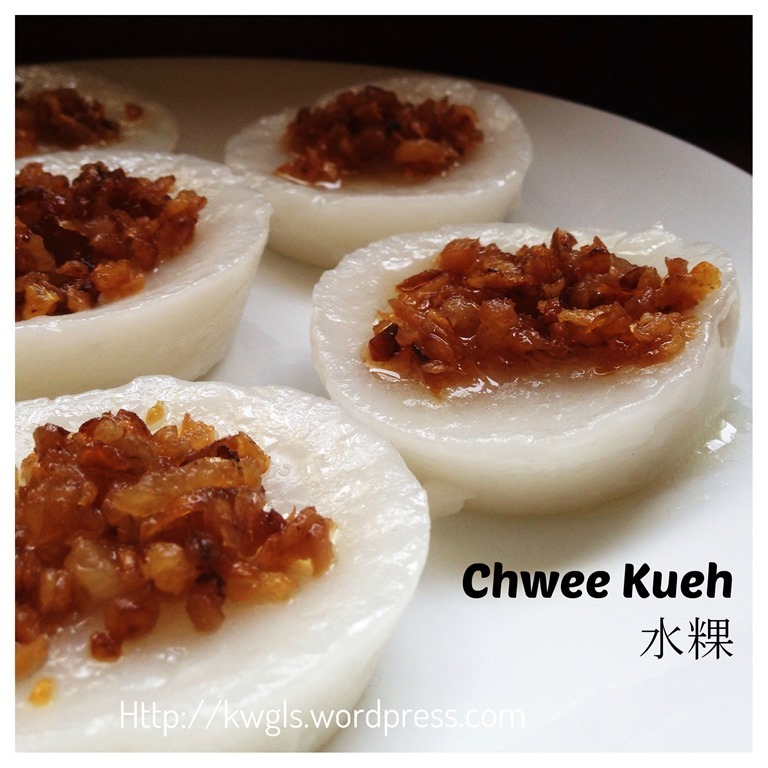 If you asked for more, you will have to pay for additional charges..
Making chwee kueh is not really in my agenda. 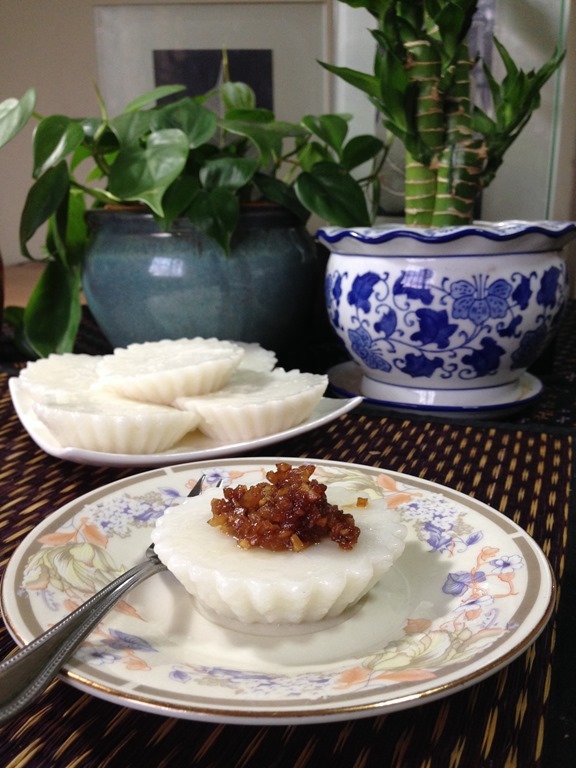 However, when one member of my Facebook Group – Food Bloggers and Foodies United, Ms Wendy Chun posted the recipe in her post here, I told her that I wanted to try making it since the preparation appeared to be rather easy and I have all the ingredients at home. 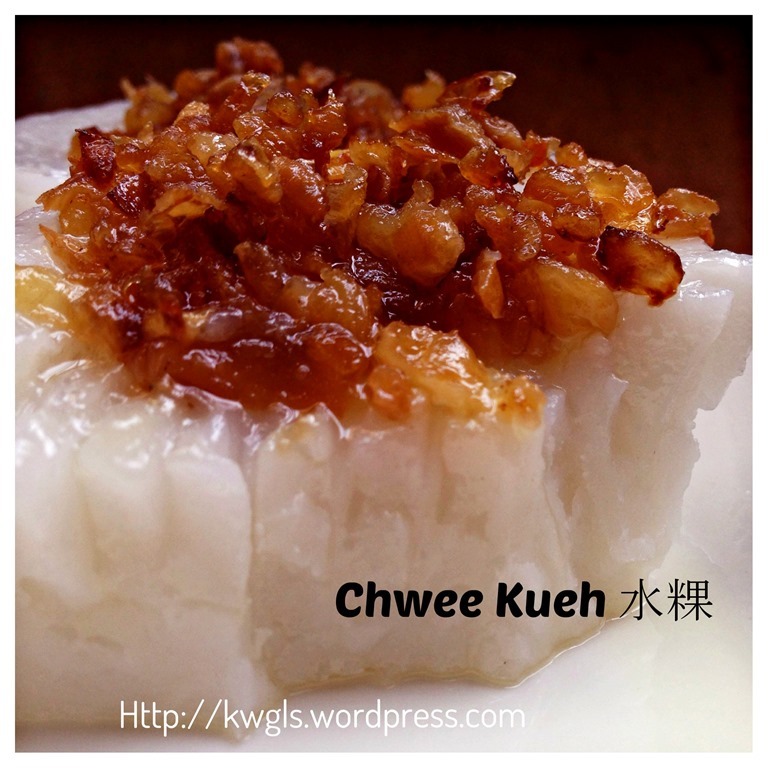 Making this will surprise my wife since this is her favourite hawker food. 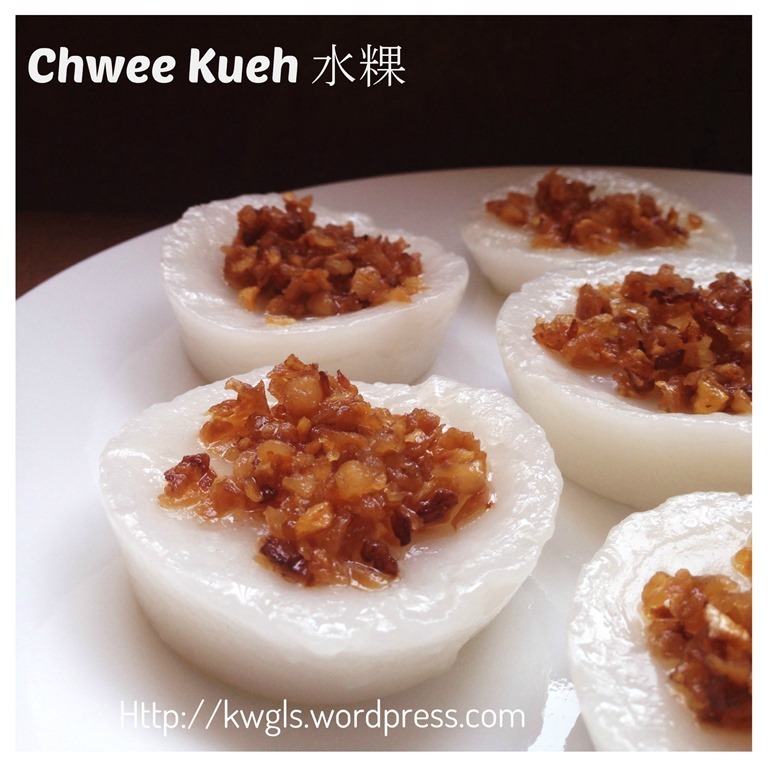 “Chwee kueh (known also as chwee kway or chwee kweh) (Chinese: 水粿; pinyin: shuǐguǒ; Pe̍h-ōe-jī: chúi-kóe; literally “water rice cake”) is a type of steamed rice cake, a cuisine of Singapore and Johor. Preparation is definitely not difficult and after taking my first bite, I believe I like it too. 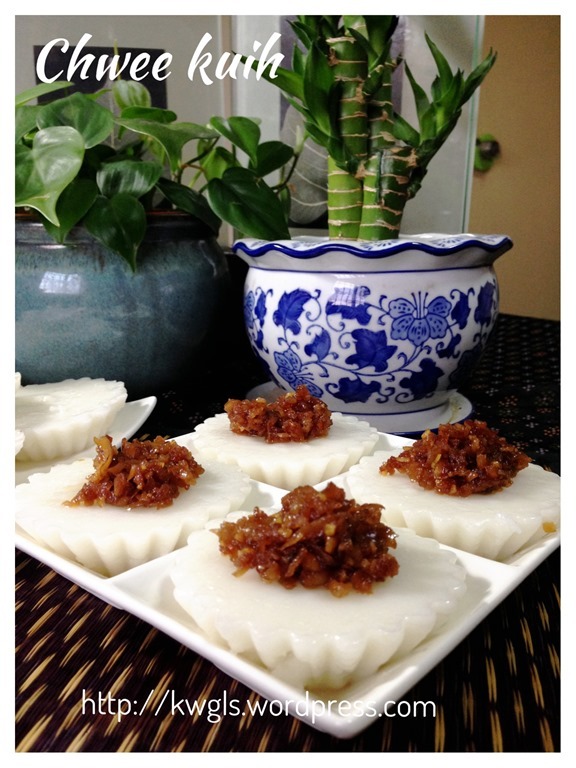 The kids liked the rice cake especially the preserved radish. 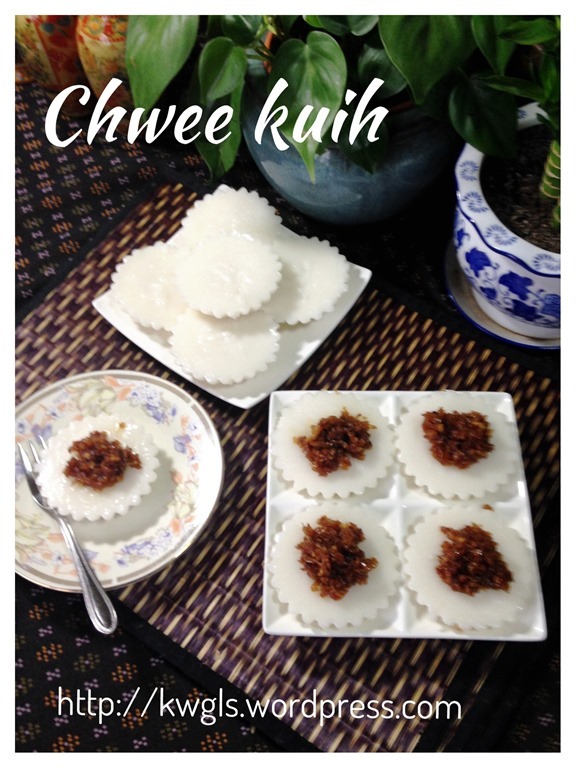 I have prepared 15 pieces from 150 gram of rice flour, it ended up that both my kids have eaten 9 pieces and leaving 6 pieces to be shared by my wife, my mother in law and me. I did not include the chilli sauce for this illustration and if you want you can always buy the ready made sambal chilli or home made chilli sauce to go with it. 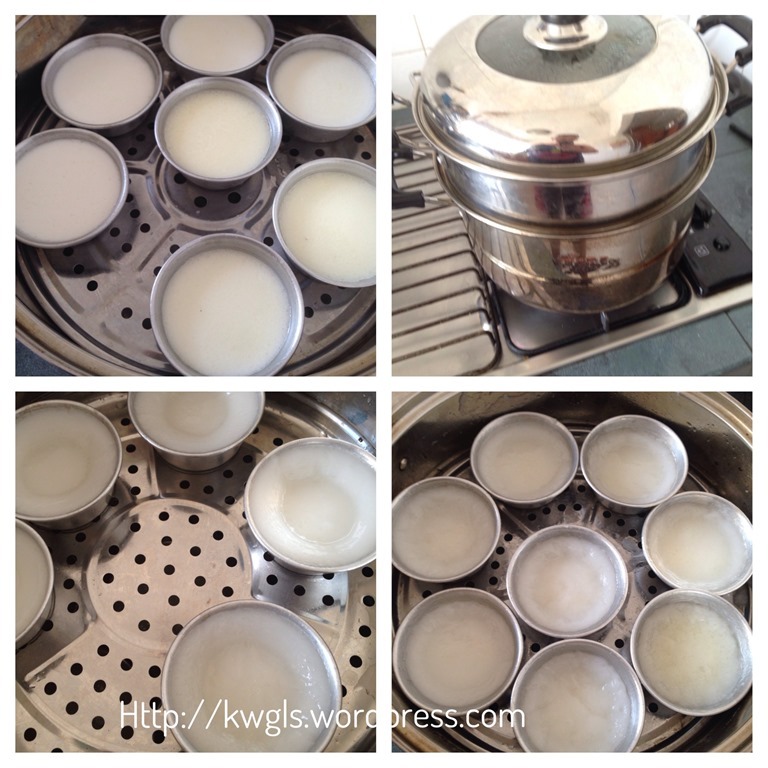 Have a steamer ready with adequate hot water for steaming 15-20 minutes and pre-steam the cupcake tins. 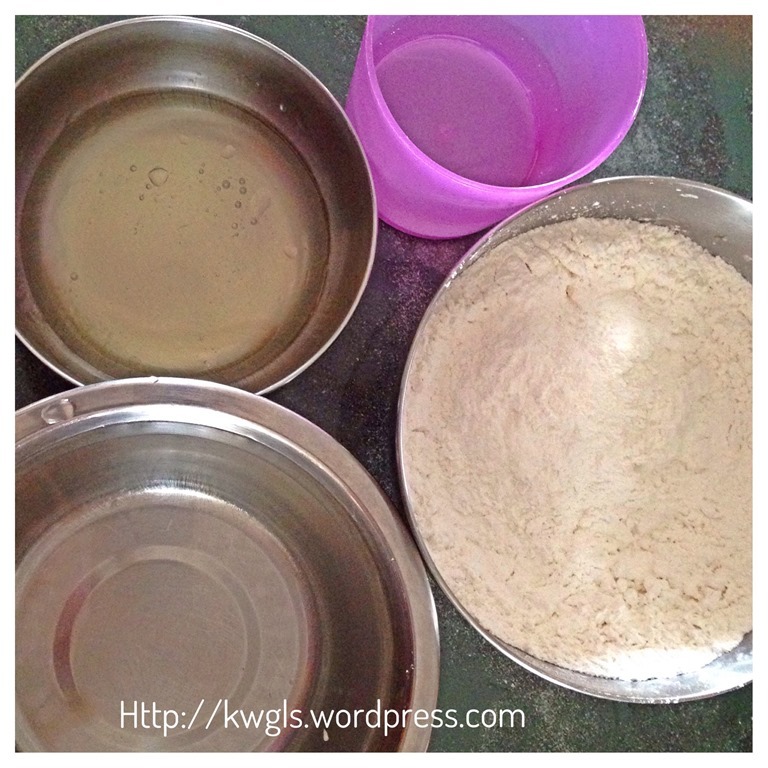 In a big mixing bowl, add the 160 ml cold water, rice flour, wheat starch and stir well. 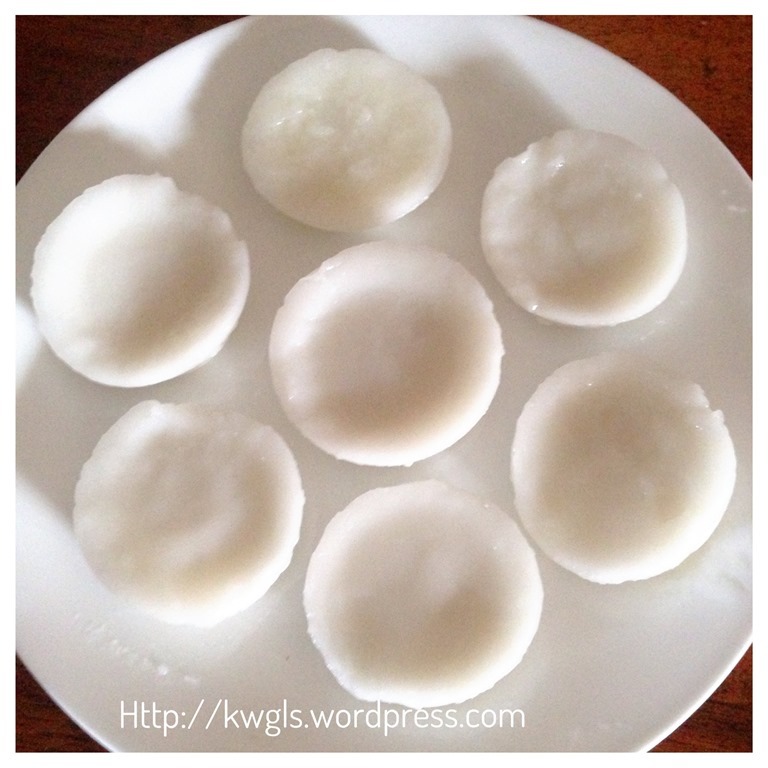 Add in 5 tablespoon of cooking oil and pinches of salt, stir well. Add in the 500 ml of hot water and stir well. Fill the flour mixture to the pre-steamed cupcakes tins with about 90% full. Steam in the steamer under medium to high heat for 15-20 minutes or when the cake is set. Once done, let it cool completely before using a toothpick or something sharp to take out the cake from the tins. Set aside. 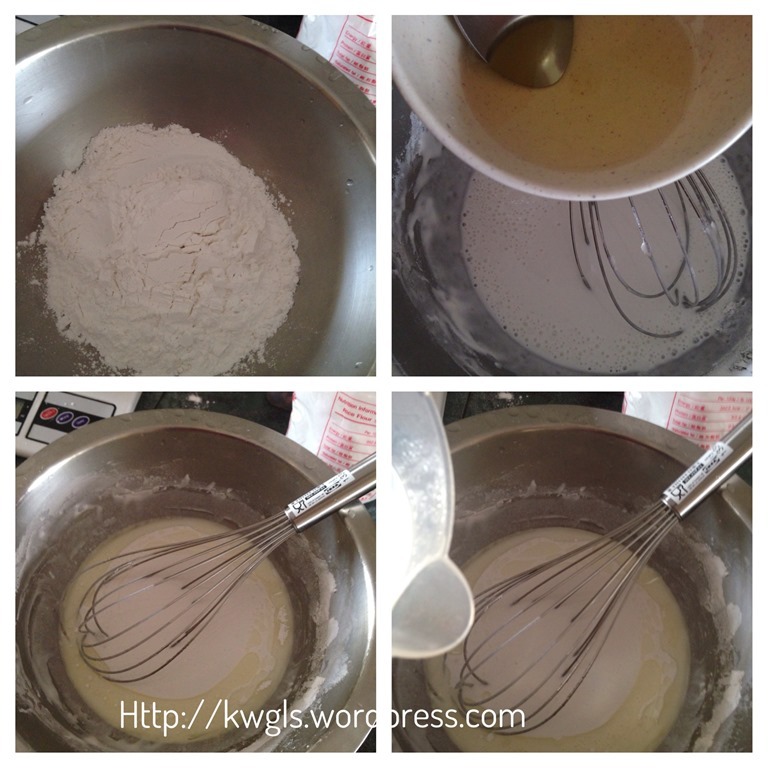 Follow the above procedures to mix the batter. 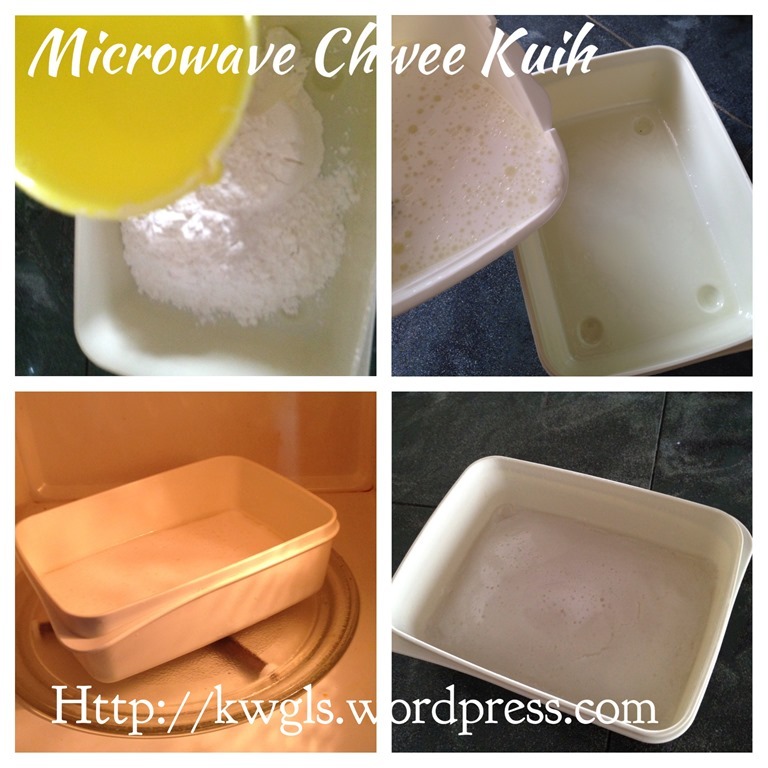 Transfer to a WELL GREASED MICROWAVABLE CONTAINER. 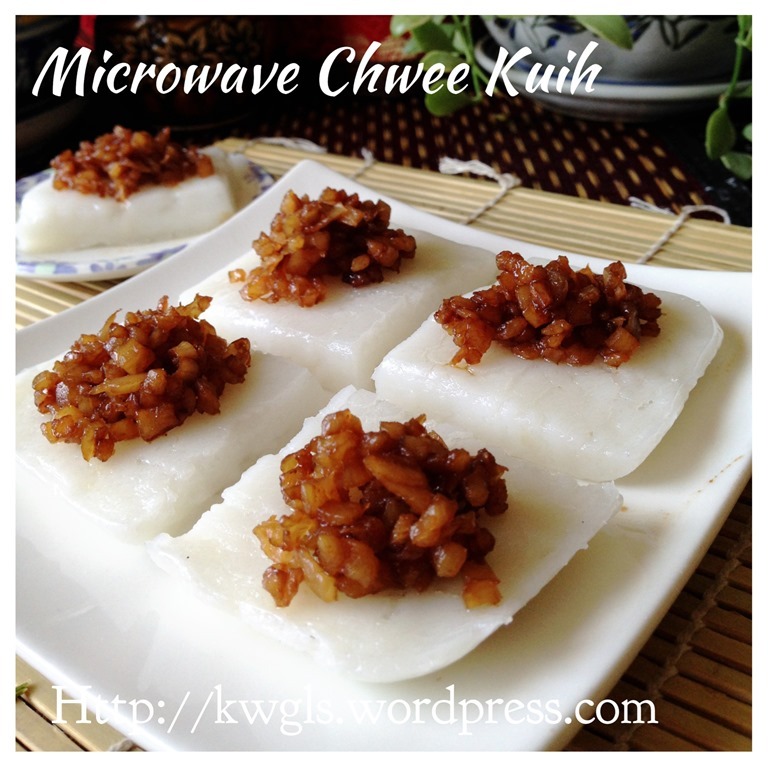 Microwave for 2-3 minutes (depending on the thickness). For thickness of about 1 cm, it took about 2 minutes. Cool completely before transfer out and cut into desired shapes and sizes. While the cake is cooling, in a big frying pan, put some cooking oil and stir fry the minced garlics and preserved radish together. 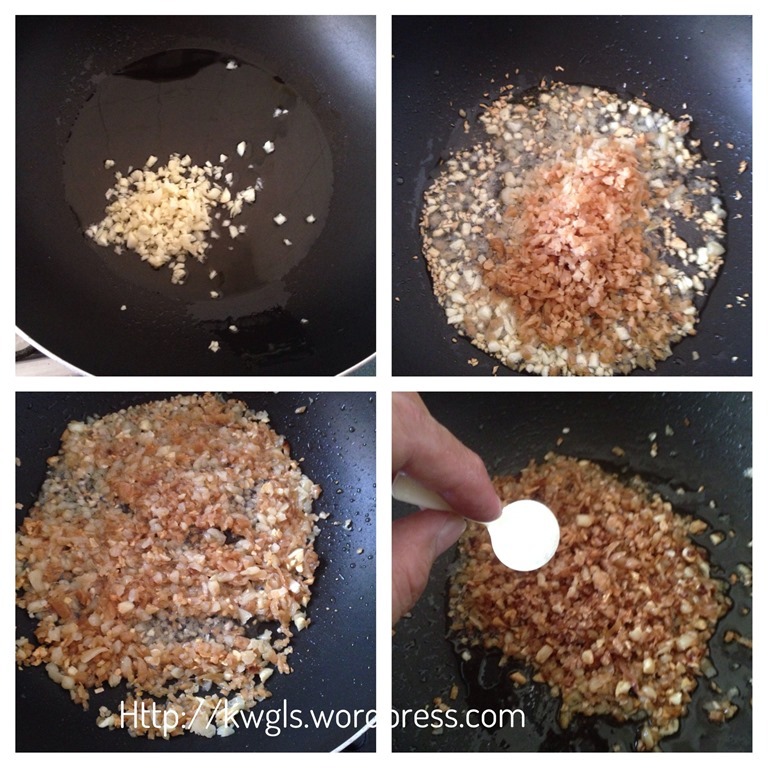 Add additional oil if not adequate. 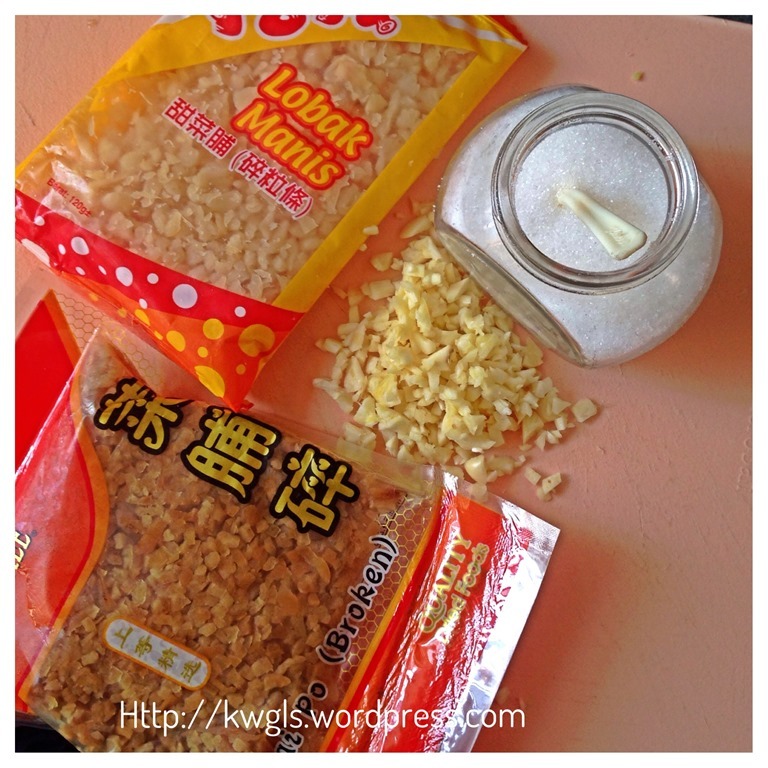 Use medium to low heat to stir fry the preserved radish as high heat will cause the preserved radish to “jump” up and down and touching it can be messy. Patience is needed in this step. 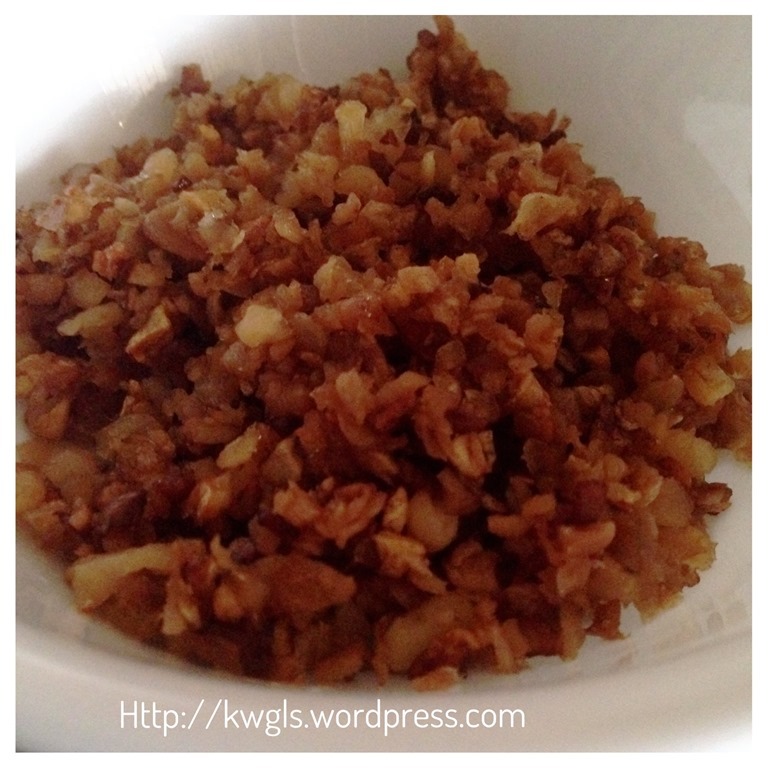 Stir fry until the radish is brownish and fragrance of preserved radish start to permeates the house. Add in the dark soya sauce and sugar, stir fry for another 1 minute until well mixed and sugar dissolves. 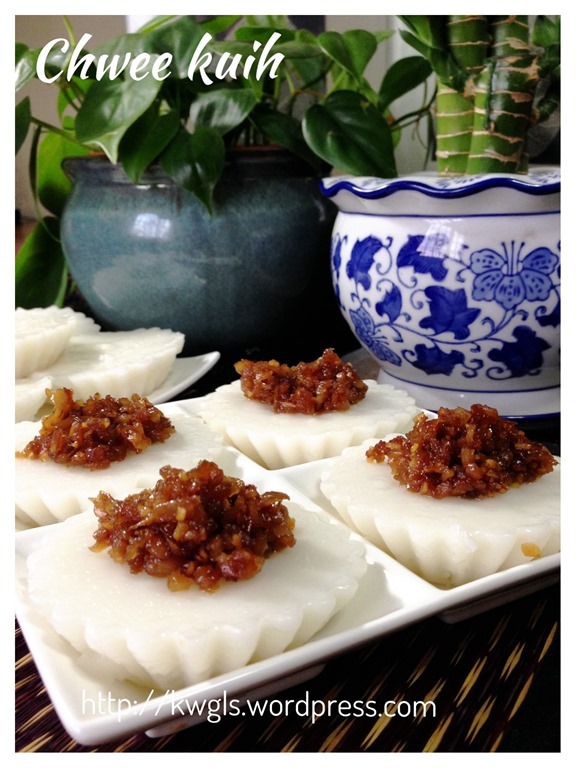 For serving, place a teaspoon of the radish on top of rice cake. 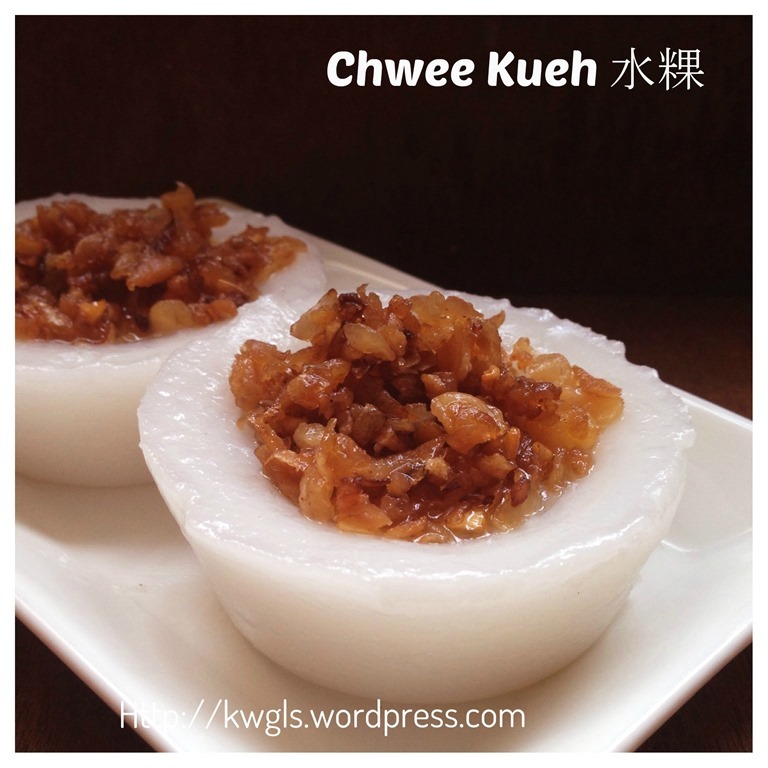 Home made chwee kueh is different from what you bought in the store. 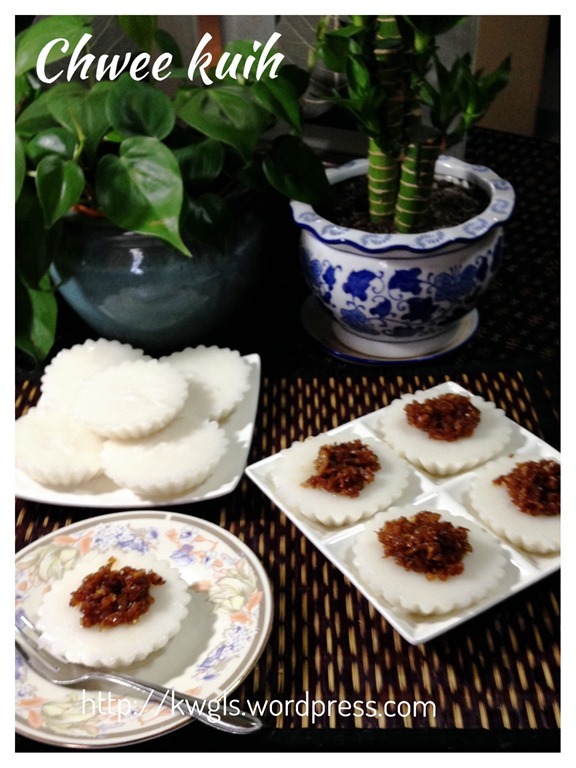 You can control the oil usage and most important of all, you can prepare as many radish as you want it to be. Do give it a try. 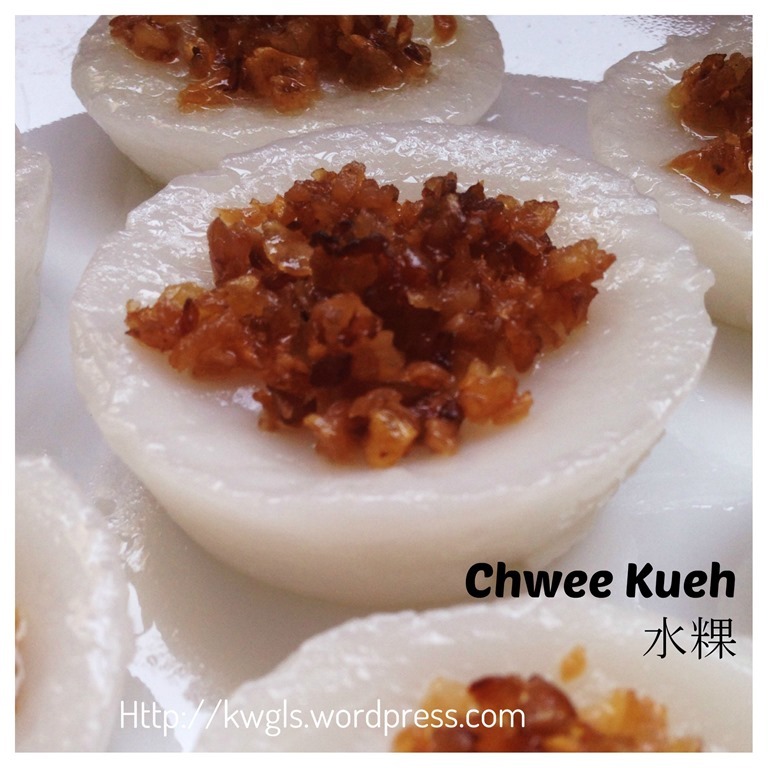 This entry was posted in Chinese and Asian Cakes and Snacks, Food Preparation Series and tagged 8, cai poh, chwee kueh, GUAI SHU SHU, Guaishushu, kenneth goh, postaday, preserved radish, rice cake, singapore hawker food, 水粿. Bookmark the permalink. 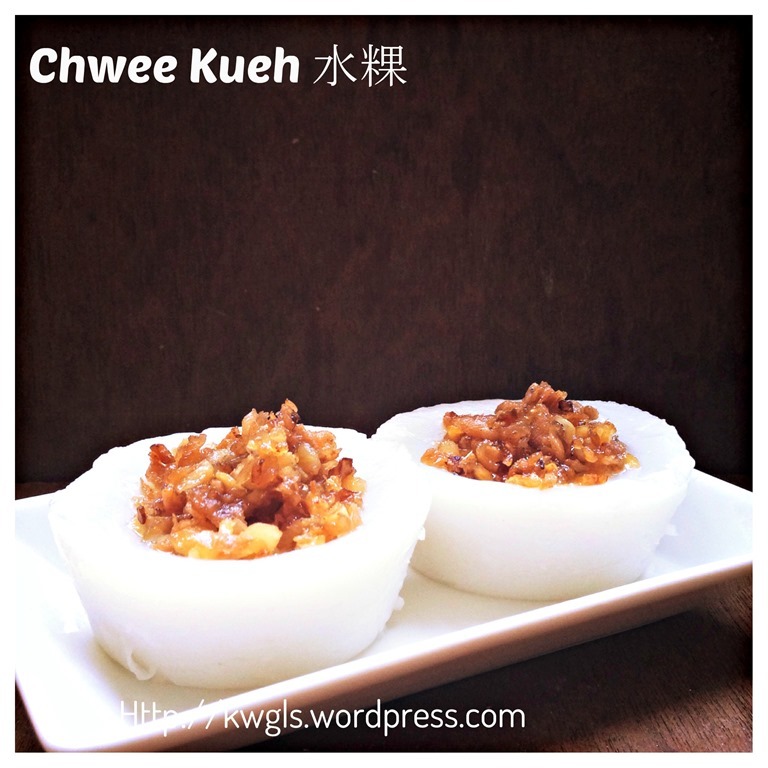 Thanks to Kenneth, my childhood favorite foods can be created without a fuss! Can’t wait to make this now. Hi! where can I buy the radish from? don’t remember seeing it in supermarkets.